Anyone who follows me on Instagram may have seen evidence of my quilting. 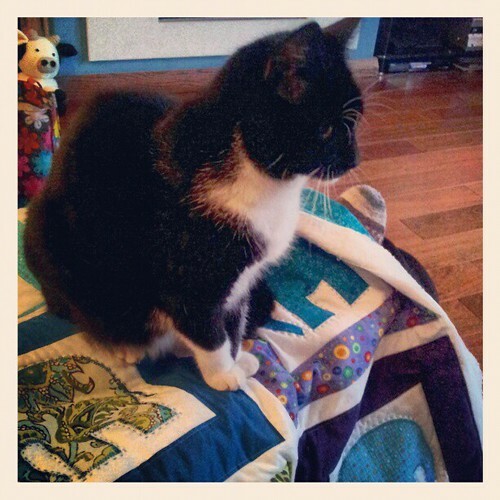 I had help testing the comfort of said quilt. She seems to approve, as she never sits on my lap normally. Obviously a quilt is preferable to a knitted blankets. As you can see from this image, I had got all the machine quilting done by the beginning of this week. I used a walking foot and stitched a quarter of an inch from the inside edges of each of the "frames". The quilting isn't perfect and there are some very strange puffy parts of the quilt, but as this is for a 9 month old to play on, I don't think anyone will care! 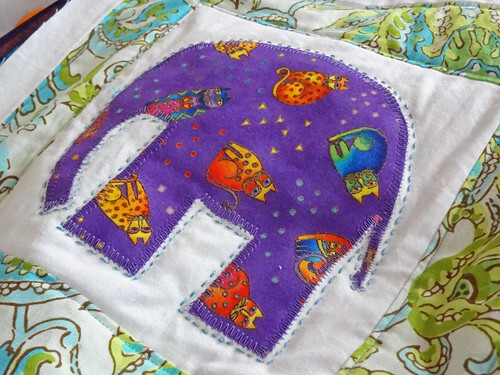 After machine quilting, I got my perle cotton out and started hand quilting an outline for each of the elephants. It only took two days to do all the outlines, and I really enjoyed it. I'd forgotten how much I enjoy hand stitching. I think with the next quilt I do, I may do most of the quilting by hand, or at least do some hand quilting. It's not perfect, but I think that is why I like it. It is a real contrast with the straight lines and crisp edges of the quilt's design. After getting all this lovely hand quilting done, I got my bias binding out. I purchased ready made binding because I was sure I wouldn't be fit enough to cut out and iron a tonne of bias binding. I also bought a binding foot. 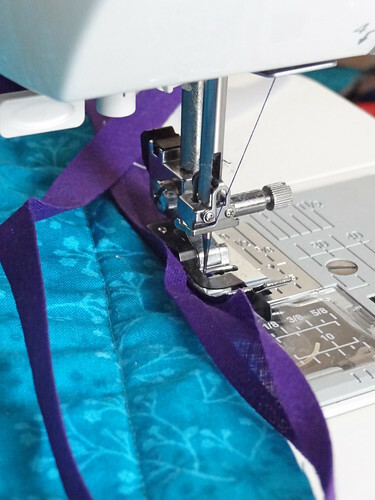 As it was the first time I'd used the foot I decided to practice on the scrap quilt sandwich that I used to determine tension for the machine quilting. I tried about 6 strips and eventually decided the binding was too narrow for me to use the foot, as I couldn't get the edges of the fabric tucked inside the binding. 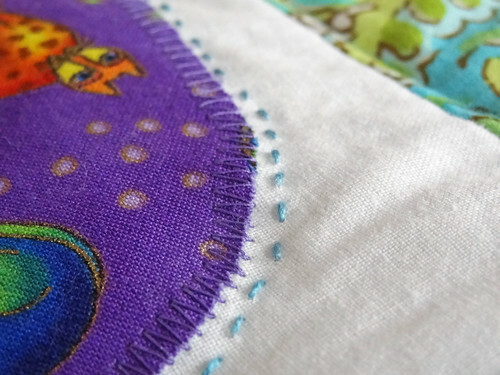 I decided to sew on the binding with a regular foot and fold it over manually and stitch from both sides of the quilt. Everything was going so well, when I realised that I didn't have enough binding to go around the quilt. I had used the binding to practice, thinking I had another pack of that colour, but I can't find it!!!! In a moment of madness, I got my Kona Colour Card out and chose some Kona Cotton in Tulip from The Village Haberdashery and some Aurifil thread, that I hope will match, and decided I would be making the binding from scratch after all. It wasn't until after I had ordered it that I realised that I could have just unpicked all the test binding I did and used that as well. DOH! Ah well, I'll see if I feel like unpicking binding this afternoon and if no,t I'll wait and see what the Kona looks like when it gets here. If I don't use it for this quilt, I'm sure it will get used somewhere else. At this point I have to mention that I've also become a thread snob within just one quilt. Using the Aurifil 50wt has spoiled me for every other thread. It really is that nice that a complete novice can tell the difference from the other threads, that I thought perfectly adequate before using Aurifil! I have decided to splash out and have ordered the Aurifil Colour Card. It makes sense for me to get it because I never go into town anymore. Having the colour card means I can order nice thread online and know it will match. It wasn't cheap, but then neither is getting the wrong colour thread, or paying for a taxi fare into town to buy regular thread and then spending two days recovering from it. I'd rather just get good thread the first time. Having the Kona Colour Card has proved so useful already that I know I'll love the Aurifil one! 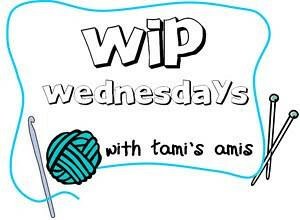 I think I've got plenty of time to get this finished, and if not we have a back up gift! After this quilt is done I only have two more presents to finish, and one of those is nearly done. I'm feeling much more in control than I normally do at Christmas. I think it's because I decided not to make everyone gifts this year. There is a much better balance between handmade by me and handmade from ETSY and Folksy, and regular shop bought gifts. I'm pretty proud of my gift choices this year. I think it's the first time in ages that I have felt so comfortable with my selections. I hope the recipients love them as much as I do! To look at other works in progress, click on the button.